I have long been interested in ideas concerning Meher Baba’s manifestation and the breaking of his silence. I have also had a long-time fascination with individual and group responses to prophecies and in how people interpret their own dreams and visions, including the unexamined assumptions and other factors that influence these interpretations. Through a study of dreams and symbolism, and through observation of my own inner experiences and mental processes, I have learned to be cautious and calm about prophetic experiences. I recognize in myself and others a kind of excitement about these experiences and the possibility of their being true, but since I am wary of delusion or ego inflation, I have tried to cultivate detachment, though not indifference, in relation to “end time” scenarios. 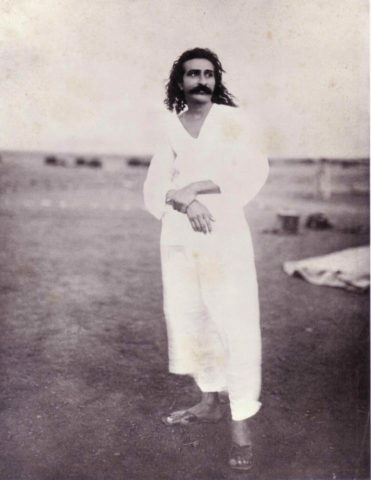 Meher Baba, 1927, Meherabad: the figure in my dream resembled this image. Symbolically my dream could be understood as a promise of the future resolution of opposites within my own psyche, the reconciliation of “enemy” impressions. The dream has not (yet) come true in a literal sense in connection with the Middle East, but it continues to inspire me. I do believe that there will be peace in the world one day, because Meher Baba has said there will be. I suspect it will be a peace unlike anything that we can imagine at present—beyond our wildest dreams. The other two notable dreams or visions (which I experienced in a half-awake state) took place in the late 1980s. In one, I powerfully realized: “The arm of Redemption is slowly being extended; but the world will perceive it as the hand of Judgment.” I understood that God does not deal out good energy to some and bad energy to others. The same one divine energy of Grace is dispensed to all, but each person receives it according to his or her capacity and nature. Baba had indicated that his manifestation would be experienced differently by different people (he likened it to the diverse reactions of people when a cobra passes through a room: “some would nervously laugh, some lose control of their bowels and some feel great courage or reasonless hope and joy”). He spoke of the need to have a proper connection to the Power House (as in the quote above). To put it another way, people who love unselfishly will receive the manifestation as light and consciousness. Selfish people will know it as fire and suffering, because they will not be able to receive the light. That was how I interpreted this dream (rather kabbalistically, in keeping with my interests at the time). Following these visions I had a series of “Messiah” dreams. I told some of them to a Boston Jungian analyst I knew, Joel Covitz, who is also an ordained rabbi and the author of a book on Jewish dream interpretation that I was editing (called Visions of the Night). His concise comment was: “You’re too impatient for the Messiah to come.” I conceded that most of my dreams of this type could pertain more to my own personal, psychological need to be “saved” than to the Avataric advent in our age. It is not given to many to have what Jung called “big dreams,” so we have to discriminate. However, the three dreams/visions I have described felt unusual in their purity (relatively uncontaminated by personal elements).I feel it’s important to honor dreams and visions that give inspiration and meaning to our spiritual lives, but one should also avoid ascribing too much importance or deadly seriousness to such experiences. I don’t believe in a phobic attitude toward life (Joel Covitz helped me to see the wisdom of that), nor toward the inner imaginal world (art therapist/author Shaun McNiff, taught me that images that come to us through dreams or art “never come to harm us”). Therefore, I am not fearful about the idea of manifestation, even if some visions (like that of Jim Auster) contain disturbing images of upheaval. Ultimately the aim and goal of life are good and pure. My feeling about Meher Baba’s manifestation is that it will be “exactly” as he said it would be, yet I don’t understand what it is with this ordinary mind and don’t feel that I need to anticipate, predict, or guess what may happen. My business is to love and remember him more and more, to hold on to his daaman. It is also important to consciously exercise a spirit of sharing with others, because I believe that the manifestation will spread through the “chain of internal links” (which Baba spoke of in the message he issued upon giving up the alphabet board). The more people you are connected to with love (and this connection can take place in various ways, whether in person or through various means of communication, in thought or prayer, through your intentions, etc. ), the better, because when the Power House is switched on, the manifestation will spread from heart to heart through those chains of internal connections. Such, at least, has been my envisioning of the manifestation. So the essential ingredient is the will to share with others. This can be completely silent and internal (“Things that are real are given and received in silence”); it may not necessarily mean going out and telling others about Meher Baba (although it could mean that too) or engaging in any particular kind of action. It could mean action of any kind, or it could mean apparent actionlessness. Calls to action based on the idea that one “must” do “something” are unconvincing to me (although the social pressure to “do” can be very compelling). For me the emphasis is on creating within oneself a suitable “vessel” for receiving what Baba has come to give — a vessel that is able not only to contain but also to share with others, pouring forth for all to partake of the infinite gift. I don’t see this as taking place through any sort of organization — it is an internal, invisible, independent network. The only “must” is God’s will for each individual. And who is to say what that is for another?